I've always enjoyed cars and trains, and particularly the amazing details found on older vehicles. The images below are extracted from photos I've taken at various transportation museums and in real-world encounters, such as the operating trams in Lisbon, Portugal. All are giclée prints using archival paper, inks, and framing materials. 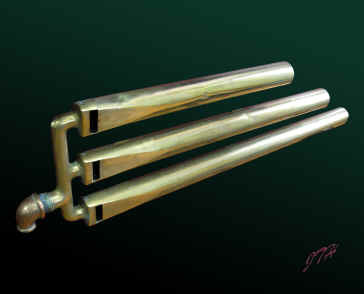 On a 2007 visit to the Stanley Museum in Kingfield, Maine, I was struck by the number of noise-making devices on one of the early Stanley Steamer cars. 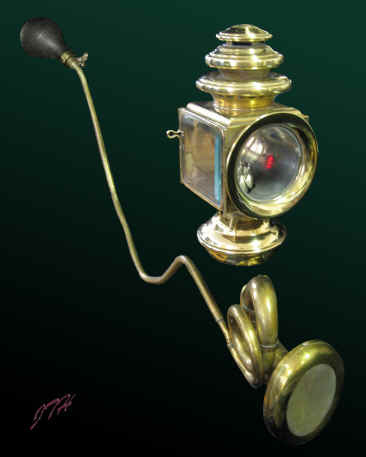 This 1905 car had the horn (above) mounted on the right side, the steam whistle (above right) mounted on the left side, and the horn (right) mounted right on the steering tiller. They really wanted everyone to know they were coming! 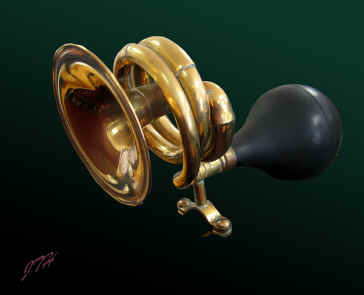 On a 1910 Stanley Steamer, there was only one horn. The gooseneck extension to the bulb drooped under the driver's doorway. 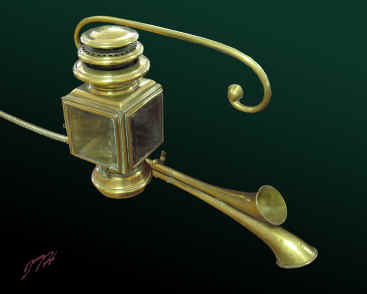 Above, a triptych of Stanley Steamer Horns and Lamps. 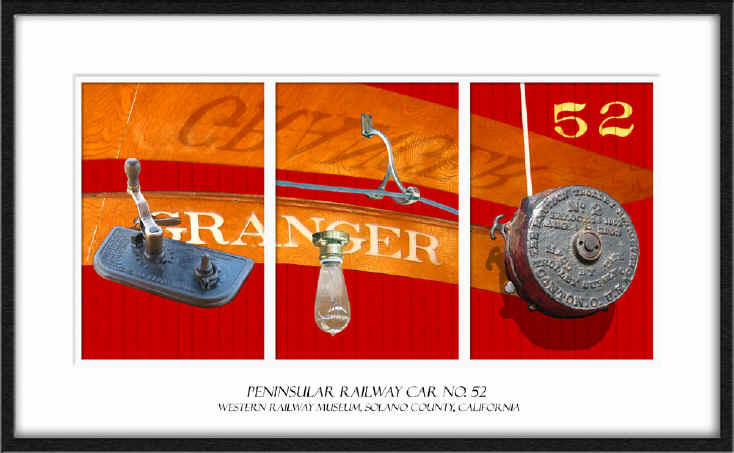 This archival giclée print is available directly from the artist. The old city in Lisbon, Portugal, features what is practically an operating museum of Brill trolleys. These little cars were built in Philadelphia over 100 years ago and are still carrying passengers every day through the narrow, hilly streets of Lisbon. The triptych below shows three views of the same trolley. On the left is the original picture, taken near the cathedral on a rainy day. The center picture is an OOB manipulation, while the right-hand image is my extraction of the very essence of the scene. This 12 x 28 inch archival giclée print is available directly from the artist. The individual 8 x 10 images are available separately. The Auto Collection at the Imperial Palace Hotel in Las Vegas has an outstanding collection of cars. One of their permanent displays is an almost- too-cute-to-be-true 1913 Ford Model T Pie Wagon. 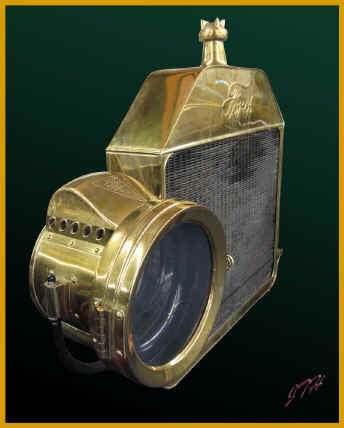 The image to the right shows its radiator and one of its brass headlights. This and other details from the Pie Wagon are available from the artist. Also available are details from a number of other vehicles on display there. 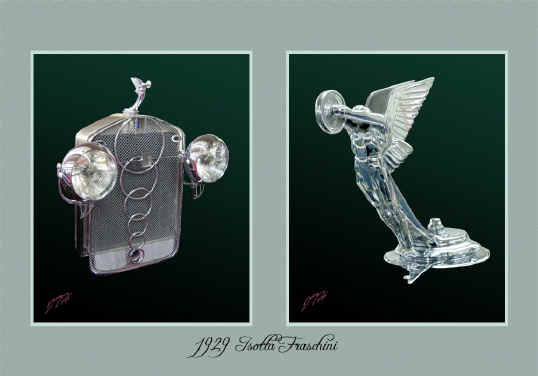 The image below is the grille, headlights, and radiator ornament of a 1929 Isotta Fraschini, also in The Auto Collection. This 14 x 20 inch limited edition archival giclée print is available directly from the artist. 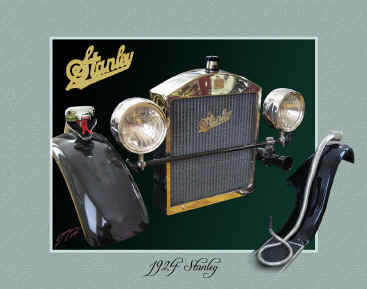 When I visited the Stanley Museum early in 2008, they had a loaned 1924 Stanley on display. On its right front fender resided a serpent that, I am told, shoots steam out of its mouth. 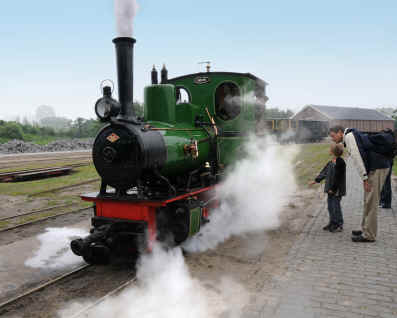 At the Smalspoormuseum (Narrow Gauge Museum) near Leiden, the Netherlands, I saw this wonderfully preserved O&K locomotive "Marijnke" getting up steam. The boy sure looks like a future railfan! 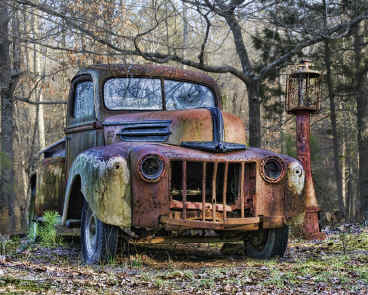 Recently I was on a bike ride with Team Redneck and spotted this old pickup truck and the hand-pumped gas pump. I used a friend's point and shoot to capture the image, then manipulated it in Photoshop.